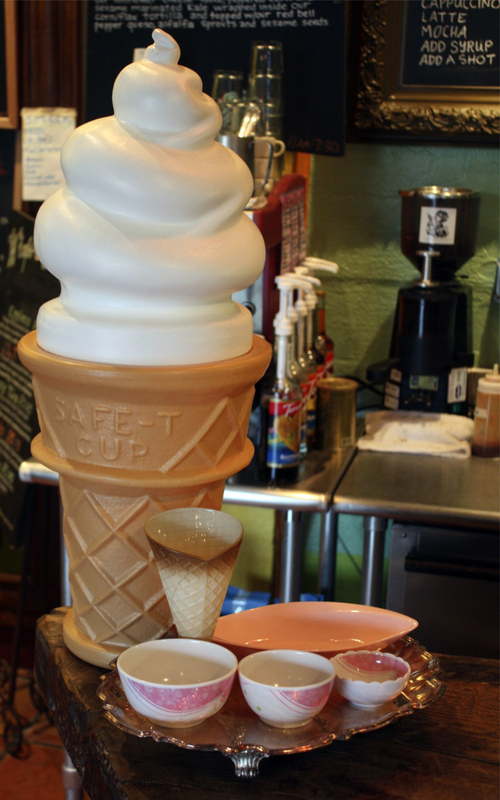 Welcome to Sweet Ritual, an old fashioned ice cream parlor serving home made vegan ice creams, house made syrups and waffle cones! We live in a little counter inside of Daily Juice Cafe in Hyde Park, Austin, Texas. I spent hours building these menu boards from absolute scratch. 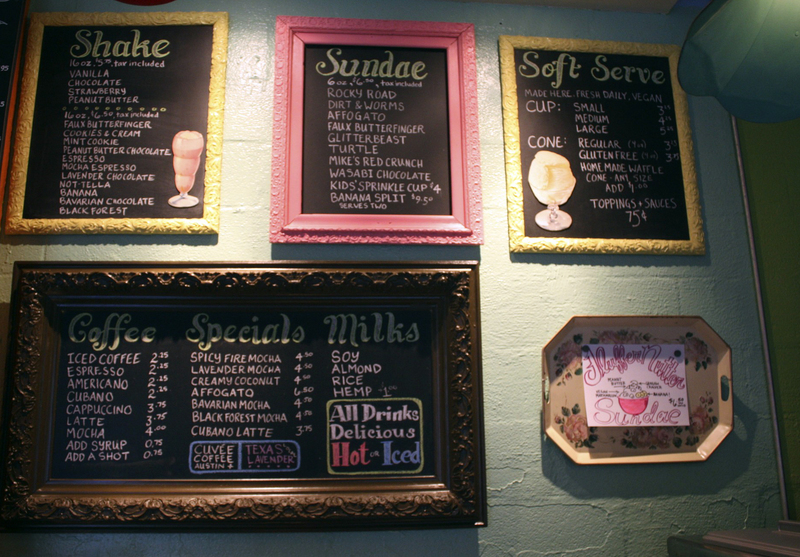 We found the antique frames at Uncommon Objects, and I painted them ice cream colors. I had boards cut to fit, and painted them with chalkboard paint. I hand lettered the menus myself – it took a while, but I’m very very pleased with how they turned out. 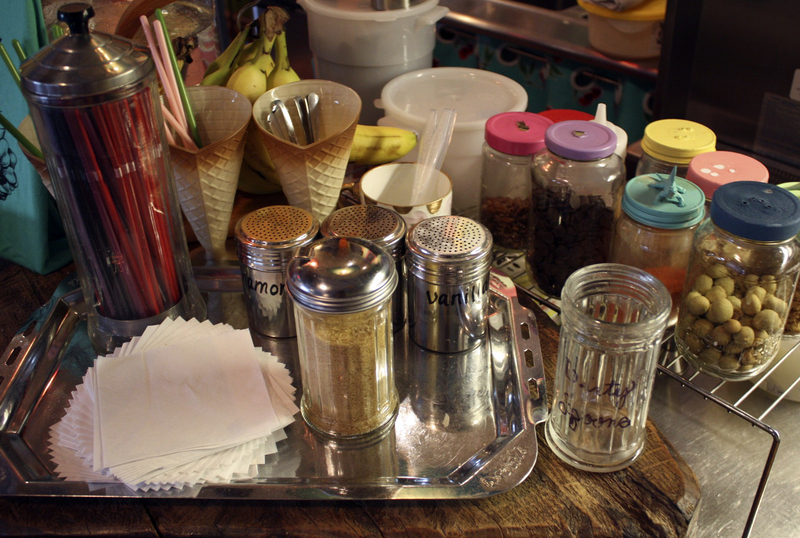 The board on the right is a metal tray with hand-painted roses that we use as the “Sundae Special” with magnets. The paper photos of ice creams from the 1960s also came from Uncommon Objects. 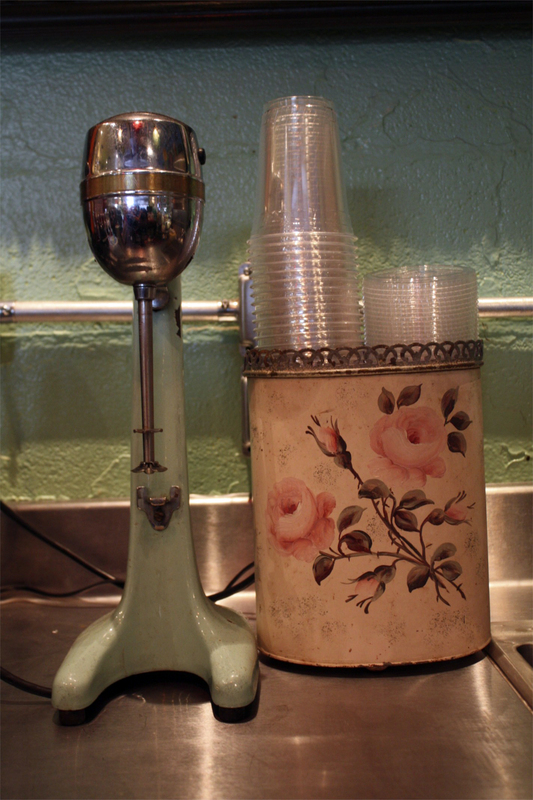 1950s mint green milkshake spindle mixer with hand-painted roses metal container. We use glass cups, but these compostable cups are made from corn if someone wants a shake to go. 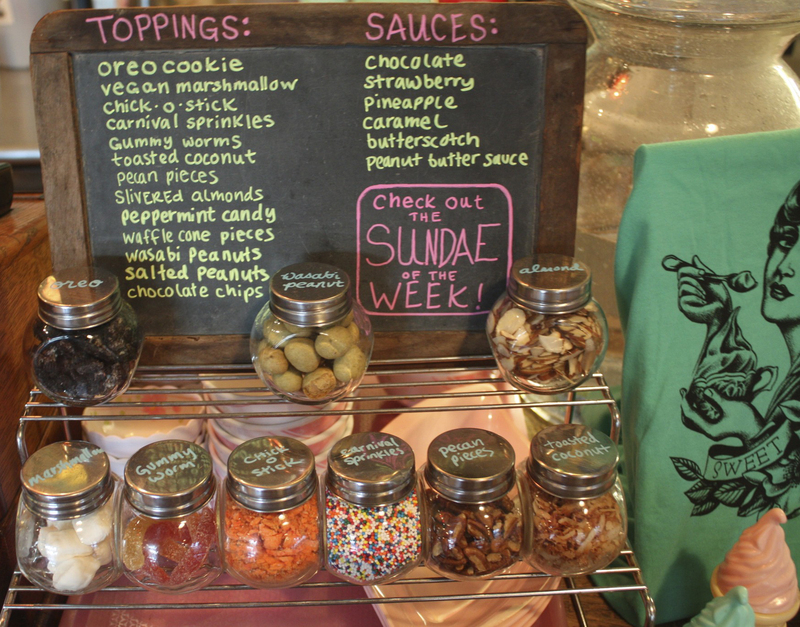 Tiny child’s chalkboard serves as our toppings board. The topping displays are little spice jars from Ikea. Straw holder is an old Barbacide container from a barber shop. Antique teacup holds the compostable spoons, and the toppings jar have color coded lids & little animals glued on them (customers have been picking the animals off one by one). 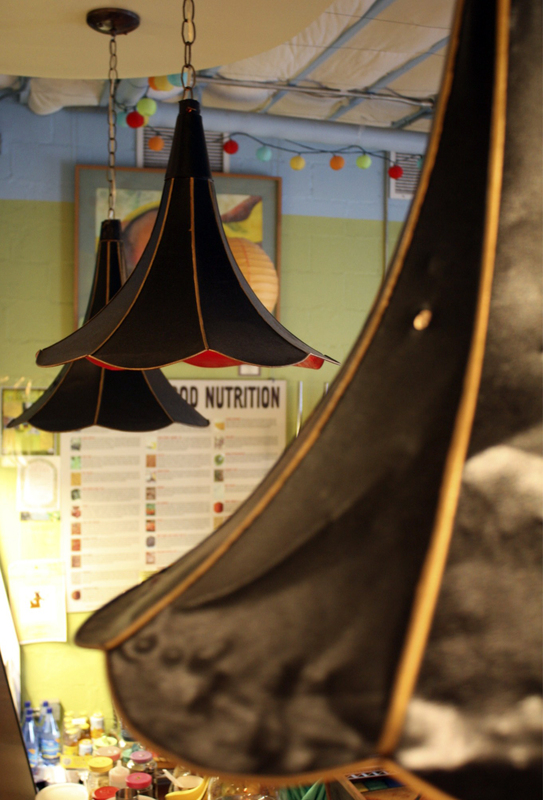 Phonograph horn lamps! Spent hours upon hours buffing, brillo padding, painting & hand pin-striping these babies. So proud!!!! A small view of our cash register, from 1916. We also have an original bell, which little kids love to abuse. 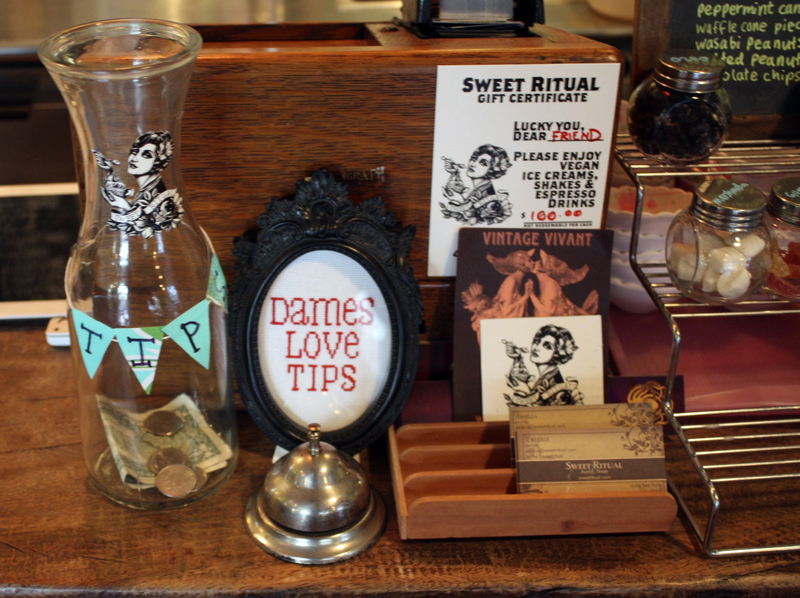 Julie Jackson (of Subversive Cross Stitch) sent me the tip jar sign. I so wish I could stop by, if only I didn’t live a few states away! 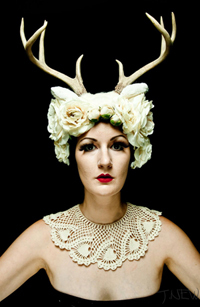 I absolutely looove your lovely lady logo artwork. It’s just DARLING. I can’t wait to get down there some time!!!! Congratulations! The shop looks lovely! The phonograph horn lamps are wonderful- ah. I love it! 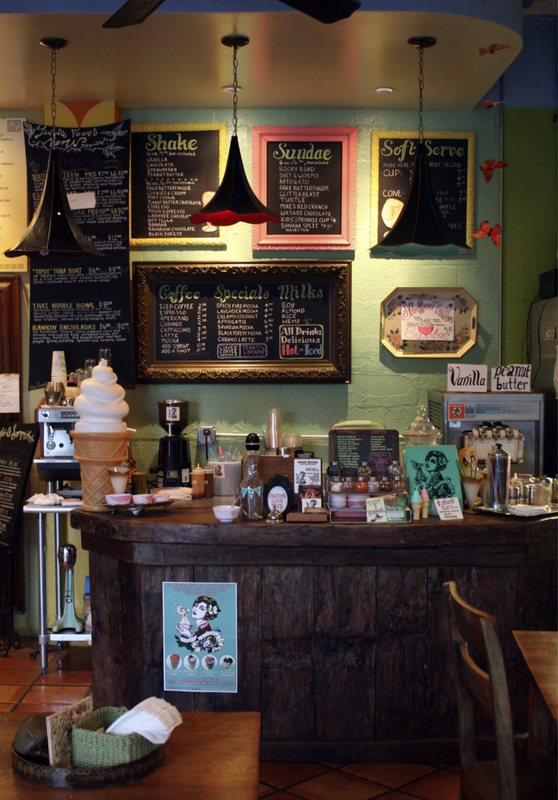 I keep stopping by Sweet Ritual, not only to see Valerie but to have the flavor of the week. Peanut butter with peanut sauce was *so awesome*! And those little jars you display your condiments in? Totally from Roy and I’s wedding. There were jelly beans in them as favors. Bought them online. Glad they’re getting a second life!